I’m participating in a fun cookie exchange today! Make sure you scroll to the bottom of the post for details!! It still isn’t looking like Christmas around these parts. And the weather still continues to stay pretty warm outside. Which is alright for me but I am secretly hoping for snow! It is so nice that I don’t have to bundle the kids up to go outside. But it just doesn’t feel like Christmas quite yet without the snow here in Utah. At least I am reminded of the holidays with the Christmas lights and the fresh cut tree in our house. And I love the neighbor cookie exchanges. Isn’t it always so fun to get a plate of assorted Christmas goodies from your neighbors? Mine have been bringing some amazing treats and cookies of all kinds. I really had to step up my game and make a few batches of goodies last week! I made these Chocolate Mallow Drops as one of the cookies and boy they were good! I love when a cookie bakes perfect and just how you like it. 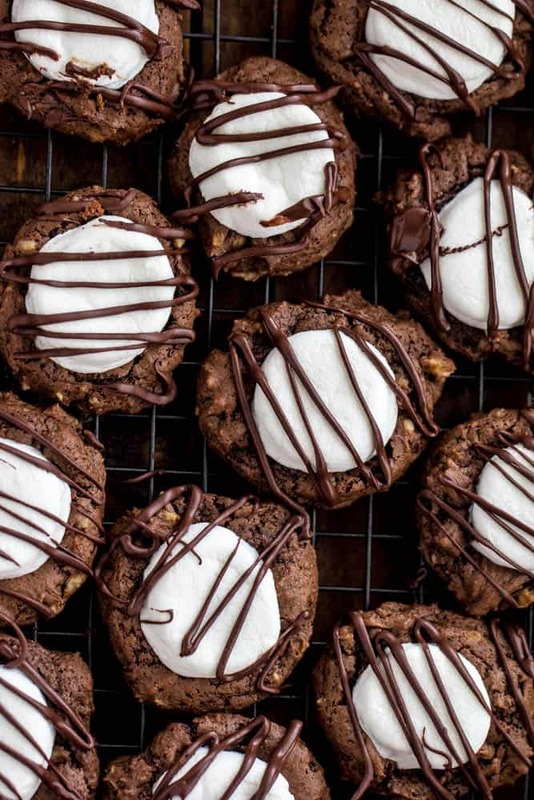 These cookies were a delicious fudgy cookie with a marshmallow layer and drizzled chocolate on top. They kind of reminded me of a hot cocoa cookie! They looked so pretty on the plate when they were done. Just another cute cookie to add to your Christmas baking list this season! 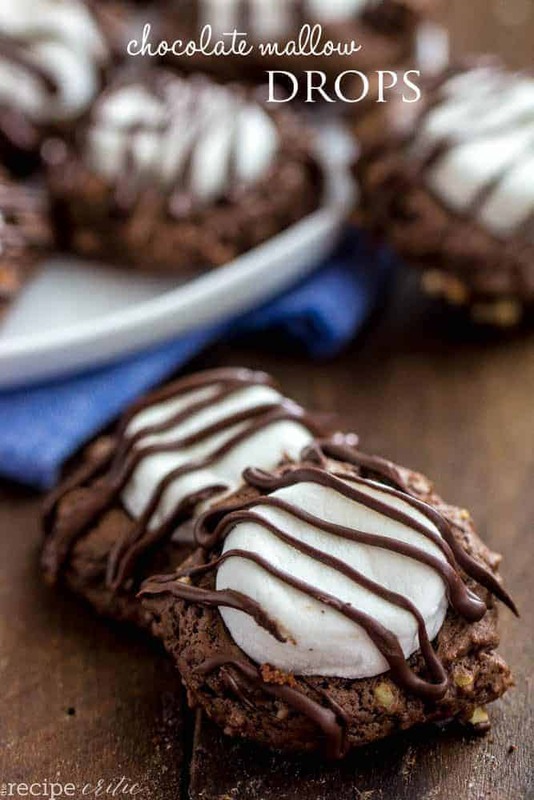 Delicious fudgy cookies with a layer of marshmallow and drizzled in chocolate! Preheat oven to 375 degrees. In a large bowl, beat together butter and sugar until fluffy. Add in egg, milk and vanilla. In another bowl, whisk together flour, baking cocoa, baking soda, and salt. Add to the wet mixture and combine until incorporated. Stir in pecans. Drop dough by rounded tablespoons two inches apart on an ungreased cookie sheet. Bake 6 minutes. Remove from oven and press a marshmallow into the center. Bake 2-3 minutes longer until marshmallows are soft and the edges of cookies are set. Remove and set on wire racks to cool completely. To make the chocolate drizzle: Melt the semi sweet chocolate chips in a microwave safe bowl stirring 30 seconds at a time until smooth. Scoop the melted chocolate into a baggie and snip the corner. Drizzle over the top of the cookies. Nothing is better than a recipe that turns out exactly how you want it to. 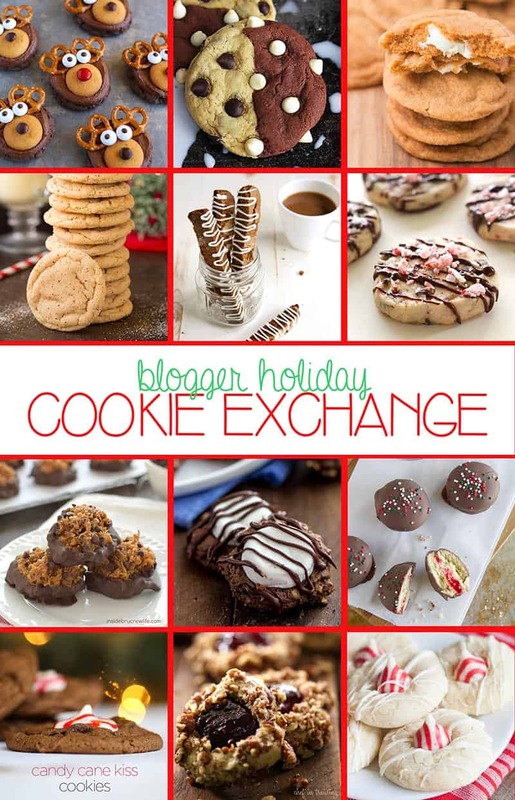 This is such an awesome cookie exchange list and I’ve enjoyed bouncing from blog to blog to view them! K – I want one of these when it’s still warm from the oven. Yum!